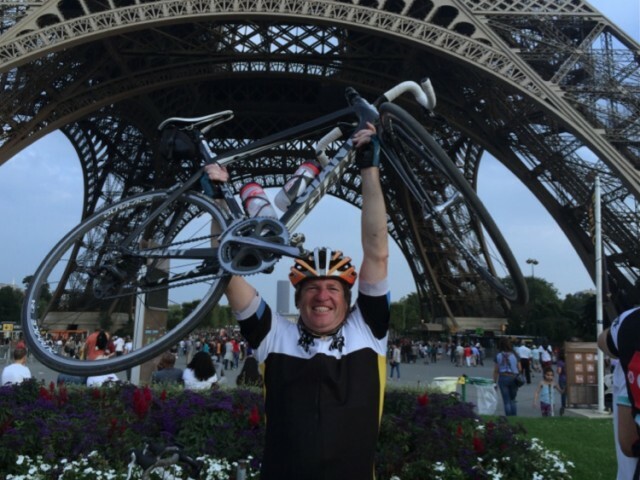 Here is the final chapter of Mike Donnellan’s diary which follows his progress from Leeds to Paris on a bike with Ride25. Mike completed the journey last week. Thanks to Mike for writing up his experiences and sharing them with all of us. To read his diary from the beginning, click here. So 645 kilometers (368 miles) completed in just 4 days, the biggest distance I have ever cycled in a single week since I started riding was now under my belt and this was the final day. The big one and it was going to prove to be eventful as always. The weather forecast was for a very warm, sunny day however we woke to find it chilly and misty. Before setting out on the final stage of this EPIC challenge I was forced to assemble a new set of cleats to my shoes as I had completed worn out the old set such has been the demands of this particular ride. Smudge, our brilliant mechanic and medic made a further adjustment to my derailleur as I was still slipping from the big chain ring to the small one. Isobel, Steve & Steve, Henry and I rolled off into the misty countryside at 8.30am this momentous Sunday morning. The towns were eerily quiet as we rolled through them. After half an hour we hit the 1st serious climb – a 10% beast that lasted for 20 mins. The sod in the mist I now call it. Then a fast decent then another grinding climb followed by a fast descent – 6 of them in all delivering 2,000 feet of ascent in the 1st two hours. We eventually caught the slow group that had left Gournay 40 minutes before us just before the refreshment stop in Marines. I entered the town 1st a couple of minutes before them. Everyone was in high spirits, we could all smell Paris, it was tantalisingly close now. The support crew had set-up the refreshment stop in a gorgeous medieval market town square and there was fresh fruit and pizza bread on offer. We walloped it down. The fastest group arrived almost straight away along with the slow group so we were all back together again. Nobody wanted to linger long and we were quickly on our way again with a short 90-minute hop to the designated lunch stop. ￼Winding our way through the hilly streets of Versailles we turned a corner and suddendly the support crew and rest of 20 strong team of riders were there, waiting for us. What an outburst of relief then followed. There was less than 10km to the finish. ￼It was a warm, beautiful evening and the late afternoon sunshine shone down, a crescendo of colour of glimmering colour. This brilliant cascade brought the whole kaleidescope of this mad venture to life. We sat astride our bikes waiting for the traffic lights to change that would give us the green light to cross to the final stop underneath one of the most famous landmarks in the world, the Eiffel Tower. The support were there with a few wives and girlfriends cheering, waving, popping champagne. We got off our bikes for the last time. We hugged, we celebrated, some were crying. And then Smudge came to me – we beamed gripping each other in a bear hug. 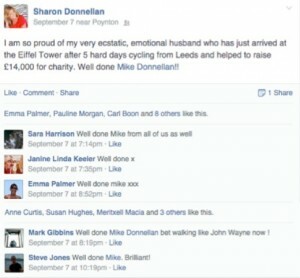 I had managed to hold my emotions together until I phoned Sharon, my wife, to announce our achievement. At that moment I could not help myself, I broke down in tears as I recalled this final day and nearly failing 50 km from the finish. She was ebullient, so proud immediately posting her thoughts onto Facebook for everyone that knows us to see. Now, a few days later as I finalised this event diary the sense of achievement has begun to sunk it and it is a brilliant feeling. I am now ready for anything and Paris to Geneva next year. What a life experience this has been. Truly amazing. I lived in a unique 5-day bubble acquiring new friends and relationships from a bunch of people that I had never met before. Never would I have dreamt that I would complete such an amazing challenge. It has strengthened me as a person mentally and physically. I feel more relaxed and confident generally and a calmness has descended on my persona. I hope this lasts as it feels brilliant.